Appalachia & Beyond: A Celebratory Giveaway - Who wants a Pic-A-Nic Basket? A Celebratory Giveaway - Who wants a Pic-A-Nic Basket? We just hit 200 fans on our Facebook page and we are ready to celebrate and say thank you to all of our fans/readers for getting the word out. It doesn't seem like very long ago that we hit the 100 mark. So to celebrate and just in time for the Fourth of July, we have a wonderful giveaway for you our fans. So we ask you, who likes picnics? We sure do and it's not summer if a picnic is not involved at least a few times throughout the season. So for this giveaway we have for you a chance to win a wonderfully Patriotic Picnic Package. Included is a cool canvas picnic basket, a table cloth, 4 plastic reusable plates, 4 plastic reusable cups, a small pack of American Flag napkins, a package of disposable/reusable cutlery, 4 telescoping marshmallow roasters (these are the coolest things ever! ), and a frisbee. 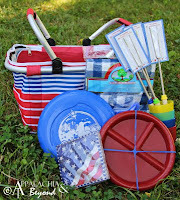 A complete picnic package just in time for you to celebrate America's Independence out by the lake, in the woods, or where ever your favorite picnic place happens to be. Just add good company and food! Main Entry - To be entered into this giveaway, all you have to do is leave a comment on our blog telling us where your favorite picnic spot is and why it's your favorite spot. If you've got a pic of the spot, leave the link to it in the comment or better yet, post it to our Facebook page. That's it! Simple right? Of course it is but just to mix things up a bit there is also a chance to get three bonus entries. In total you can have up to four chances to win this great package. Bonus Entry #1 - This one is pretty simple. All you have to do is A) Like Appalachia & Beyond on Facebook and B) Mention this giveaway in a post on your Facebook page. Make sure to tag Appalachia & Beyond in your post to your wall. That way we know you've shared it. Once you've done that, come back here and leave a separate comment on this post telling us you've done so. We will be checking to verify that you liked us and shared a post on your wall. Bonus Entry #2 - This one is pretty simple as well. All you have to do is: A) Follow Appalachia & Beyond on Twitter and B) Tweet the link to this giveaway post on your Twitter. Be sure to tag (@anbblog) in your tweet so that we know you've tweeted it. Once you've done that leave a separate comment on this blog post stating that you have done so. We will be checking to verify that you are following us on Twitter and tagging us in your tweet will let us verify that you tweeted the giveaway post. Bonus Entry #3 - If you have a blog of your own, mention the giveaway in a post on your blog and provide a link back for your readers. Once you've done that come back here and leave a separate comment providing us with a link to the post. There you have it. These are all the ways to enter. Of course the main entry of telling us where your favorite picnic spot is and the reason why it's your favorite is mandatory to gain entry into the giveaway. The picture link or picture posted to our Facebook Wall is optional. You have until June 25th at 11:59pm EDT to enter. We will close comments at that time. We will announce the winner on June 26th.